For the 14th consecutive year, the University of Toronto’s Rotman School of Management will host one of the world’s top student trading competitions. The Rotman International Trading Competition (RITC) is an annual event that draws students and faculty from 52 universities worldwide—countries represented include China, Iceland, India and South Africa—for a three-day simulated market challenge. 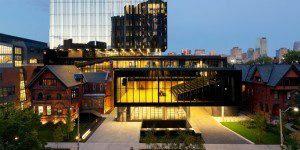 This year, RITC will take place Feb. 23–25 in the Rotman School’s BMO Financial Group Finance Research and Trading Lab. The Lab is home to the Rotman Interactive Trader, which links to real-time data feeds and allows users to purchase and sell stocks, options, futures and fixed income investments from North American markets. During the competition, teams will participate in a variety of events including electronic and outcry trading cases, seminars with industry practitioners and social events with fellow competitors. RPM: The Rotman Portfolio Manager, which offers real-time portfolio tracking with portfolio and performance analytics. RITC: The Rotman International Trading Competition, sponsored by BP. Other sponsors include Flow Traders, MathWorks, and S&P Global Market Intelligence. Finance Lab: The Finance Lab is a state-of-the-art facility that focuses on the integration of theory and research with practice.